Ex Hex’s new album It’s Real is now available in full. 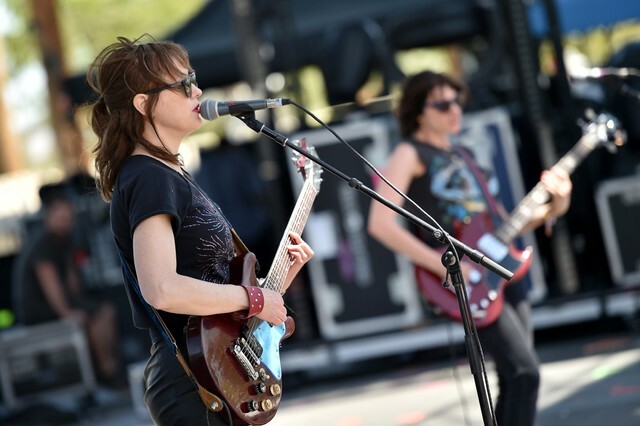 The new album comes after an almost five-year hiatus for Mary Timony, Betsy Wright, and Laura Harris. The trio released their debut, Rips, back in October 2014, and have used the interim to focus on other musical projects. Wright teamed with Laura King as Bat Fangs for a self-titled release last year, while Harris has been performing with the Death Valley Girls. Timony also reissued albums from her old band, Helium, and played a short run of North American tour dates in 2017. Ex Hex released the first single from It’s Real back in January (“Cosmic Cave“) and have since dropped two more tracks, “Tough Enough” and “Rainbow Shiner,” the former of which came along with a music video. The band told the FADER that their aesthetic for the new record was: “Sounds like another dimension.” Timony, Wright, and Harris will be touring behind It’s Real a little later this year, with shows running through April and May. Check out It’s Real below.